Choosing the right floor is an important part of putting together a green home. It’s about more than just picking a floor that’s produced in a sustainable, responsible manner. You also need to pay attention to how your body reacts to the floors you walk and stand on. There are a lot of options out there, but not all of them are healthy options, for us or the environment. Cork flooring is one option that’s both ecologically friendly and inviting. Conventional flooring products are neither attractive, or eco-friendly. Most of them are also bad for our health. For instance – the majority of floor covering in the US is nylon carpet. This substance wears badly, and tends to emit a gas containing volatile organic compounds, which are hazardous to our health. Once nylon carpet is removed from a home, it’s disposed of in a landfill, since it’s not biodegradable. Vinyl flooring, used in many bathrooms and kitchens, has similar problems. Pthalates found in this material have been blamed for problems in child development. Synthetic laminate woods aren’t much better. While they use recycled lumber waste, this mostly goes into them in the form of fiber board, a short lived product that contains a lot of formaldehyde. Hardwood floors are healthier and fully natural, but may not have be as sustainable in the long run. You should also pay attention to the finish that’s used on any hardwood floors – most are petroleum based and bad for air quality. 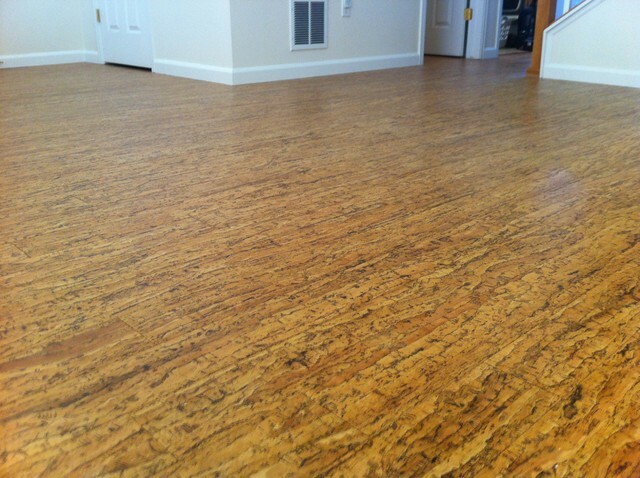 Cork as a flooring is solid, sustainable, and long lasting. This material comes from the bark of the Mediterranean cork oak, harvested by hand about once every ten years. The cork grows back without harming the tree, and the tree itself can live for over two centuries. That makes cork one of the greenest possible options, since even the excess material gets used in bottle corks. You can get different colors and textures, depending on how the cork has been treated, and the material is naturally resistant to insect damage, moisture, and fire. Cork also solves many insulating problems, both for heat and sound. It’s gentle to walk on, sparing your back, knees, and feet. Just remember to pay attention to how your cork floor has been installed. Some urethane finishes may contain VOCs, much like other petroleum based products. Wax is a safer option, but it’s less durable. For cork, installation in a glueless tongue-and-groove style is recommended. Since cork is a hypo allergenic material, it’s good for use in playrooms and kids’ bedrooms, as well as for people who suffer from allergies to other materials. Remember that cork isn’t a permanent type of flooring. It can be scratched, and needs to be replaced after about ten years. High traffic areas will wear faster, and lower traffic ones may last longer. Resealing your cork floor may also be necessary, but a well sealed floor can be mopped or cleaned with gentle, non abrasive cleansers.